Purpose. Model BA-9-1000 is a 9:1 balun/unun kit used to translate a 50 ohm input up to 450 ohms at RF power levels up to 1000 watts when used with a matched load. It provides conversion from unbalanced coax to balanced ladder line/antenna feed point and gives a 9:1 impedance step-up to reduce SWR on the coax. Place at the junction of the balanced line and the coax to convert from balanced line to unbalanced coax.It can also be wired as an UNUN with unbalanced coax input to unbalanced output such as an end fed antenna. KIT Contents. 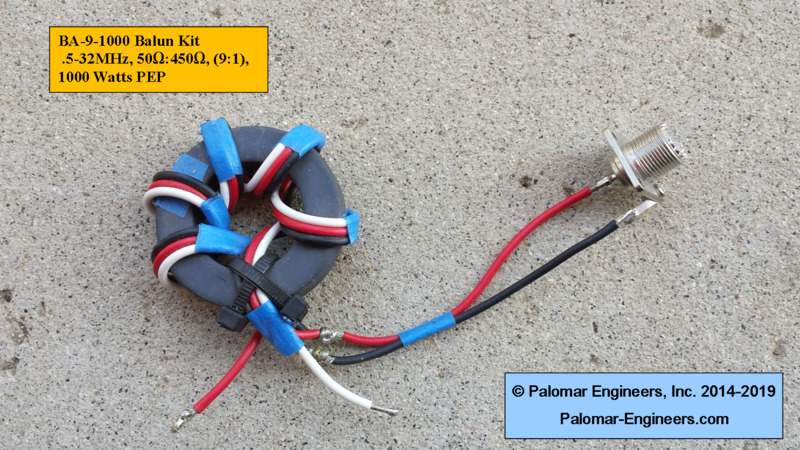 The kit consists of a ferrite toroidal core, three colors of insulated wire, a SO-239 UHF connector with stainless steel hardware, and an instruction manual.